In a city where shopping only comes second to breathing, this dazzling, modern desert city has a host of beautiful golf courses to play. Consistently, and deservedly, crowned as the most visited city in the Middle East, and landing sixth in the latest global ranking of top tourist destinations, Dubai is a must for the avid traveling golfer to visit. He’s a brief description of some it’s most popular-courses. My favorite (and home) course, the Els Golf Club is something special. Drawing inspiration from Ernie Els’ lifelong love of links golf, the Els has set about recreating some of these design features into a desert’s oasis landscape. This ‘desert links’ combines undulating, generous fairways (perfectly moulded with native vegetation and sandy waste areas) with lightning-fast greens. Your short game has got to be on the money here, as the Els’ greens could make a saint curse. Check out the clubhouse’s signature restaurant, Big Easy Bar + Grill for world-class cuisine and a great wine cellar including some stunning wines from Ernie Els’ own South African vineyard. This restaurant really pumps on a Thursday night, as the professional expat crowd kicks off the weekend. 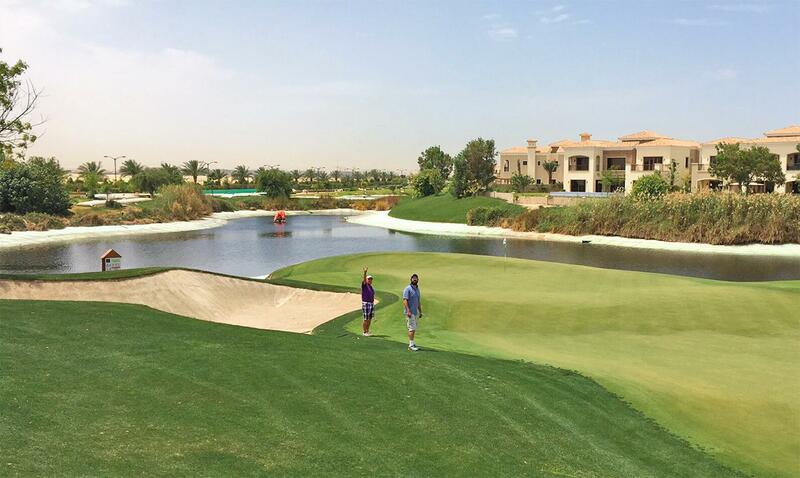 With water on only 12 of the 18 holes, this club is a sporting oasis that challenges most punters. 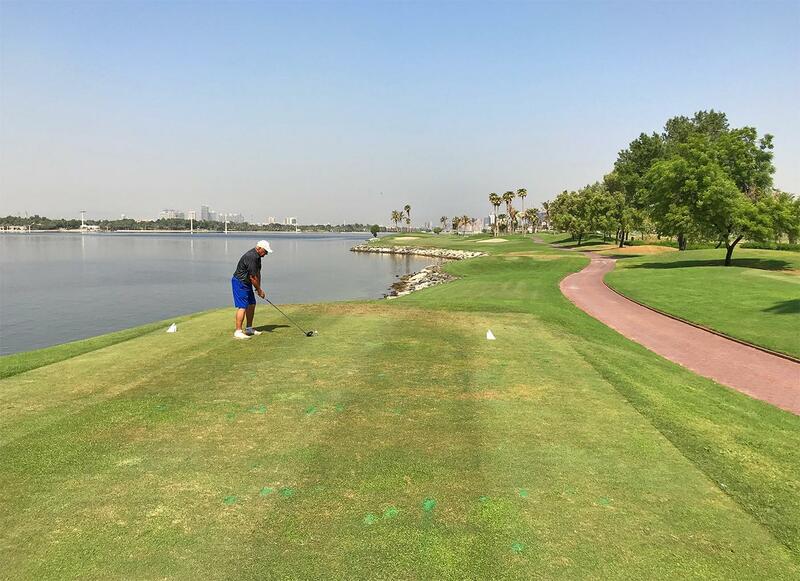 The golf course is in the heart of the old city and encased by Dubai Creek. The course is so green you wouldn’t believe you are in the Middle East. As a matter of fact, when playing there, it’s easy to forget that you are in the heart of a desert. The Dubai Creek Golf & Yacht Club is considered an ‘establishment’ course in Dubai and it boasts one of the most photographed landmarks of the city – a majestic clubhouse that is designed to mirror the sails of a traditional Arab dhow boat. 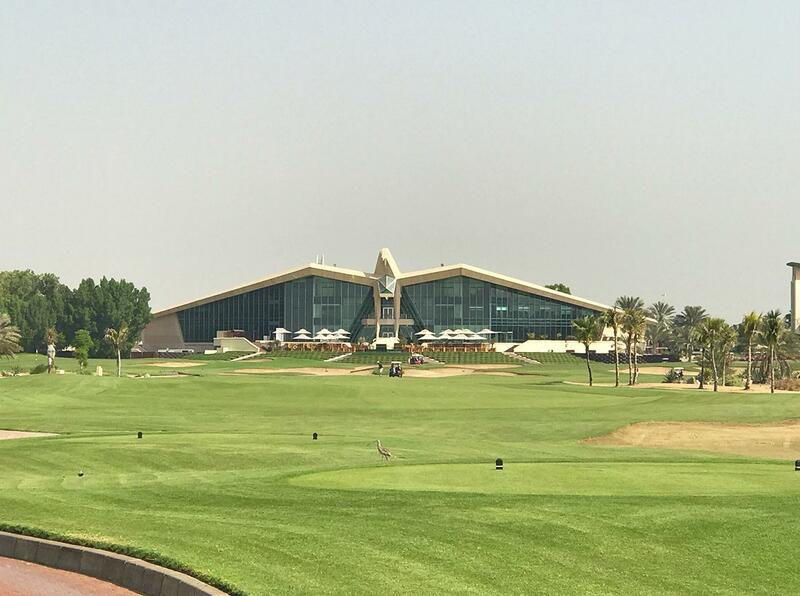 With two courses to choose from, Earth and Fire, there is something for everyone at this newer club, which is home to the DP World Tour Championship ‘Race to Dubai’. The Earth course consists of rolling fairways and brilliant white bunkers that are framed by an abundance of trees and shrubs, making each hole picture-perfect. It is the only course I am aware of in the region that has a meandering creek running the full length of the final hole. The Fire course, however, has a more rustic desert feel, which is visually stunning. Don’t be fooled by the deep-red landscape and wide open fairways; the Fire course demands a well-thought-out strategy. Going directly at the flag may not always be the best approach and this gives Fire a strong sense of classic links-style play. If the heat of the day is too much (and there are a few months of the year when that is likely to be the case), then why not tee off early in the evening and play a full 18 holes of night golf? 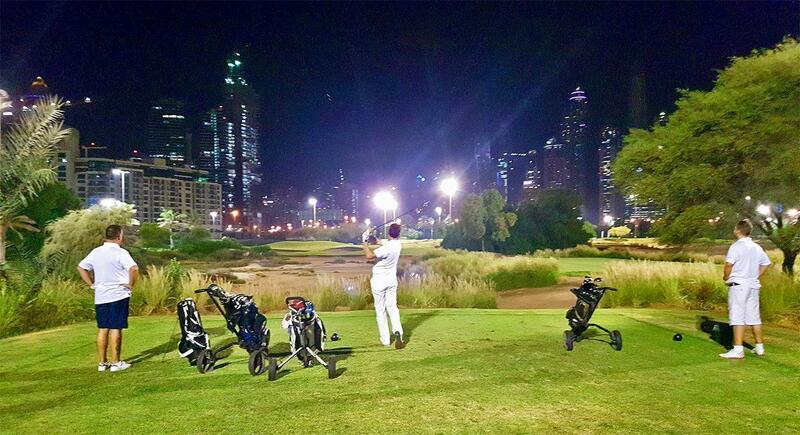 The Emirates course under lights is a popular way to get a round in after work. This was the first golf course in Dubai and it’s home to the Dubai Omega Desert Classic. 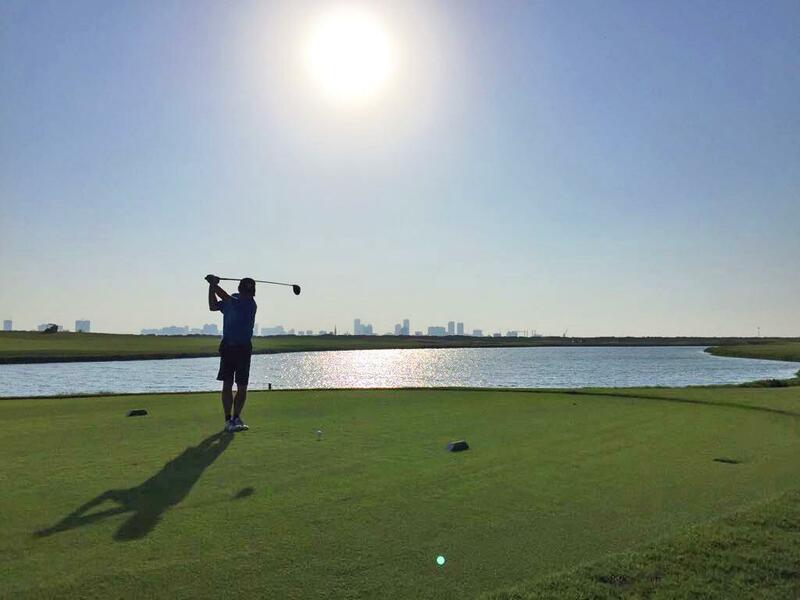 The Emirates Golf club offers two well-manicured golf courses to play – Majilis and Faldo. No golfing trip to Dubai is complete without playing at least one of them. About an hour away from Dubai, heading south into Abu Dhabi, is another popular golf course to play – the Yas Links golf course. The course is on a man-made, ‘entertainment precinct’ island and is surrounded by famous attractions that include a Formula 1 Grand Prix racing track, the Ferrari World theme park and the Du Arena (a live music venue where globally-celebrated artists such as the Rolling Stones, Madonna, Andrea Bocelli and have performed). The Yas Links golf course is one of those golf courses you just have to experience. The 18th is one of my favorites, and is a fine finishing hole where the shoreline snakes along the left hand side of the fairway, threatening shots all the way from tee to green. A hint for the newcomers: the safest option is to play away from the water, avoiding first a central fairway bunker off the tee, then a long waste bunker down the left side of the narrow green. 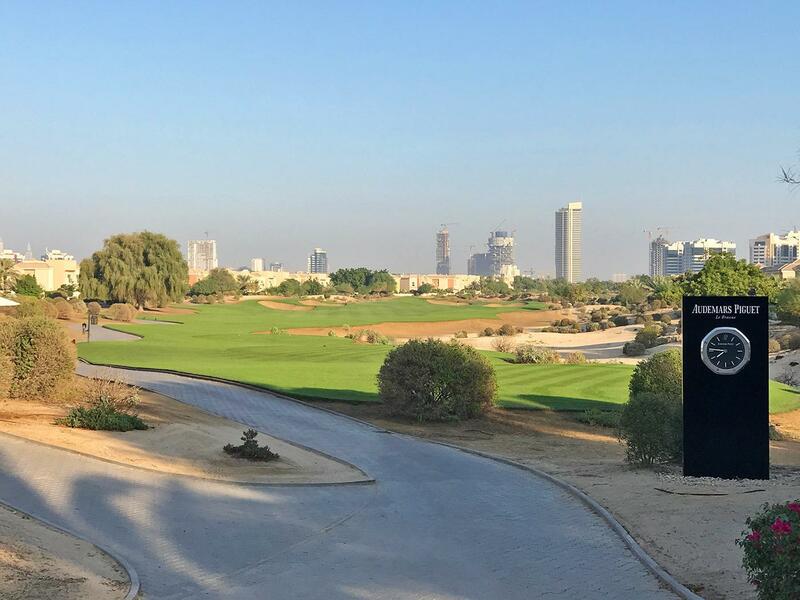 With several other beautiful courses in Abu Dhabi just minutes away, including Saadiyat Beach Golf Resort and the Abu Dhabi National Golf Club (home of the HSBC Championship), I’d suggest making a weekend of your trip to Yas Island. 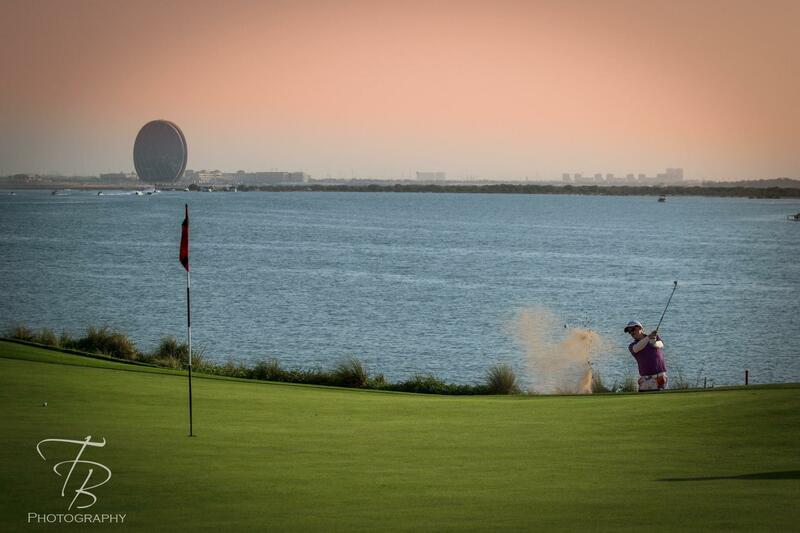 Dubai is now trending as one of the world’s most sought-after golfing destinations. Understandably so. While visiting Dubai, you can experience the hospitality of luxurious 5 & 7 star hotels, visit a wide range of world-class attractions, take in mind-blowing desert getaways and play some of the finest golf courses to be found.